If you have a VIP access pass or First In Line access pass in Universal Studios Hollywood, you can go behind-the-scenes and have "meet & greets" with the stars of Terminator 2 3D (seasonal). The behind-the-scenes takes place about two times a day during off-peak season. Kimberley's back from the dead. She gives a basic introduction and asks if anyone has questions. She's then interrupted, again, by John Connor who rapels from same spot as he does in the show. He's scripted to say, "I have a question: Can I join your show?!" Of course, some of the actors change it (e.g. "Oh my God, she's back from the dead!"). As he makes his way down the stage, Kimberley introduces the actor and mentions whatever shows or movies he's been in. John then does the same for Kimberley. They then go on to introduce the stage manager and show where the projectors are located. Kimberley gives some facts about the center screen and shows the audience how the motorcycle comes on stage. They then introduce, the star himself, the Terminator! Who comes in from the side door that they use when the bike's broken. He busts through holding the plasma rifle and a rubber replica of Sarah's AR-15 automatic rifle. Either Kimberley or John talks about movies or shows the actor's been in. Terminator then gives a trivia fact about Arnold Schwarzenegger's pay in the movie. 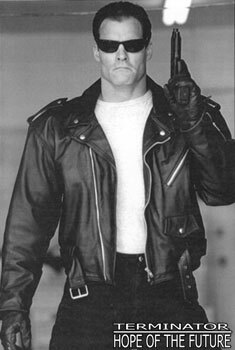 For example, the famous line, "Hasta la vista, baby," costed about $84K. John brings out a Mini-Hunter model that was held by Arnold, and lets guests touch, not handle, the model. They then talk about the police and weapons training they went through, and how many shows they do in a day. They also say how many actors are hired, which acts as a segue to Kimberley's next line. "You're forgetting some. My favorite guys." John or Terminator: "But I thought we were your favorites." Kimberley then asks the audience for help and tells them to yell out "ACTION!" on the count of three. Her favorites are, drumroll, the four T-70's. They then open it up for any questions the guests might have then take pictures with the T-70's, Terminator, John, and sometimes Kimberley (time permitting).